Like many of his friends in the Korean education system, 18-year-old Seowon Chang always had a strong interest in math, physics and design, but found it hard to apply and develop these skills because of his lack of confidence in speaking English. However since moving from his native Songdo to Korea International School (KIS) in Jeju 18 months ago — where all classes are taught in English — Seowon has discovered a new language and a whole new world where he can showcase his talents. In February of this year Seowon took part in the Odyssey of the Mind contest, a national-level Korean contest where students must take on and complete various challenges, ranging from designing and building specific items to communicating and storytelling without speaking. As part of a team of seven, Seowon and two other students used their strong math and design abilities to spearhead the team’s efforts to create a structure that could hold the most weight, whilst being as light as possible. Inspired by real-world structures such as France’s Eiffel Tower, Seowon and the team designed and built a tower from balsa wood that despite weighing just 15g was able to support a massive 115kg. Combined with excellent results in the other rounds of the competition, this was enough to take the overall win, allowing the team to qualify for the international round of the contest. 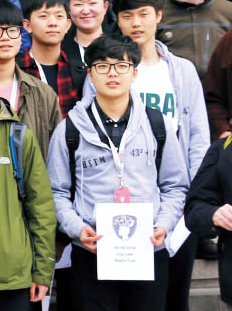 Fresh from his success in the Odyssey of the Mind contest, in March Seowon travelled to Suzhou, China with three other students from KIS’s Jeju campus, to take part in the High School Team Math (HSTM) competition. Held annually, HSTM is a two-day international contest focusing on math, and especially how it can be applied to the real world. Competing as part of a six person team from various international schools, Seowon used his math skills to solve conventional problems in the first stage of the contest, before moving on to the second stage, which required out-of-the-box thinking and creativity to apply math to real-world situations. After Seowon and his team picked up an overall team prize, they were challenged to go out into the city to explore ways in which math can be linked to the design and layout of various buildings and areas. Alongside studying for three AP exams in math and physics, Seowon is extremely interested in continuing to apply the lessons he learned through these contests. In particular, he hopes to learn more about the specific theories that underpin architecture and urban design, and is planning to keep exploring the ways in which the subjects he studies in the classroom can be used to solve problems in the real world.